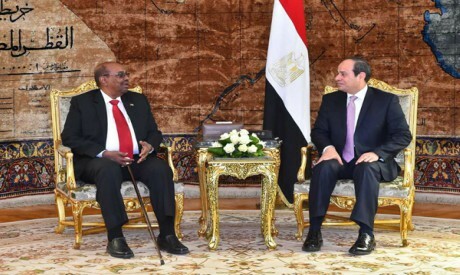 Less than two weeks after the return of Sudan’s ambassador to Cairo following his recall to Khartoum for consultations, Sudanese President Omar Al-Bashir arrived in Egypt’s capital for talks with President Abdel-Fattah Al-Sisi. According to an Egyptian government source, Al-Bashir’s visit followed an invitation extended by Al-Sisi via General Intelligence chief Abbas Kamel who visited Khartoum last week. “I guess it is very obvious there is an attempt to push contacts so as to ensure pending issues are addressed on a systematic basis.Where these talks will lead has yet to be seen. We do not expect fast progress on any of the files, but slow progress is not such a bad idea for now,” he said. Officials in both capitals acknowledge the list of differences between Cairo and Khartoum is long. Red Sea security, and managing trilateral negotiations over the Great Ethiopian Renaissance Dam (GERD) which bring together Egypt, Sudan and Ethiopia, are among Cairo’s priorities. Egypt has not concealed its dismay with the way Sudan has positioned itself alongside Ethiopia in the trilateral talks despite Addis Ababa’s refusal to accommodate Egypt’s worries about the impact of the dam on its water needs. Construction work on the dam is nearing completion and Cairo expects Ethiopia to begin filling its 75 billion cubic metre capacity reservoir towards the end of this year. “We have a crisis plan should Ethiopia withhold more water than we expect but we are still hoping for a better deal which should be possible if we can secure the support of Sudan,” said an Egyptian government source. Speaking after a meeting between Al-Sisi and Al-Bashir in Cairo on Monday informed sources said no Sudanese promises were forthcoming on the issue, though Khartoum did say it would try to encourage Ethiopia to be more sensitive towards Egypt’s worries. A ministerial meeting of representatives from the three countries is due to be held in Ethiopia between 5 and 6 April. On Red Sea security, Sudan has yet to firmly decline an offer from Turkey to pursue joint Turkish-Sudanese military cooperation with a possible Turkish base in Sudan overlooking the Red Sea. An informed Cairo-based foreign diplomat said Sudan remains open to the Turkish offer. “There is so much foreign military presence around the Red Sea, some of it Arab, some of it not, and it is not all base located. Turkey and Iran have a direct and indirect presence. Understandably, this is not to the liking of Egypt and it makes sense for Egypt to try to limit this trend,” he argued. Sudan has long expressed concern over the level of cooperation between Cairo and Juba. Egypt made no promises to reduce its levels of cooperation with South Sudan. Egypt and Sudan agreed during last month’s 2+2 meeting of foreign ministers and chiefs of intelligence to discuss strategic matters related to Red Sea security measures and during their talks in Cairo on Monday Al-Sisi and Al-Bashir agreed in principle to resume security and military consultations soon. A Sudanese source said Khartoum would host a new round of 2+2 consultations and expected other meetings to follow. In a press statement on Monday afternoon Al-Sisi announced that he agreed with Al-Bashir the two countries should resume suspended meetings of joint committees on political consultations, security, cooperation and technical management of Nile water. The two leaders also announced they would work on connecting their countries’ electricity grids and railways. Al-Sisi and Al-Bashir also agreed to resume cooperation on border management. According to sources on both sides, this will reduce the border infiltration both countries complain about though it will do little to resolve the long running dispute over the Halayeb Triangle. “The Egyptians and Sudanese are historically one people. Of course we are two countries — each with its own borders and flag but we remain one people,” Al-Bashir said during the joint press statements he made with Al-Sisi at the presidential headquarters in Heliopolis on Monday. There was no shortage of niceties during the two appearances Al-Sisi and Al-Bashir made on Monday, one before and the other after their talks. Al-Sisi addressed Al-Bashir as “a dear friend and kind visitor”. He qualified the relations between the peoples of Egypt and Sudan as “sacred”. Al-Bashir said that Egypt is his “second country” and Sudan “the second country of President Al-Sisi where he is always welcomed”. A statement issued by the press office of the presidency in Egypt said that officials in both countries would work to schedule the convening of the next Joint High Committee. The last time the committee — chaired by both presidents — met was in Sudan in 2016. President Al-Sisi received the Sudanese president on his arrival to Cairo International Airport, and escorted him to the airport on his return to Khartoum.